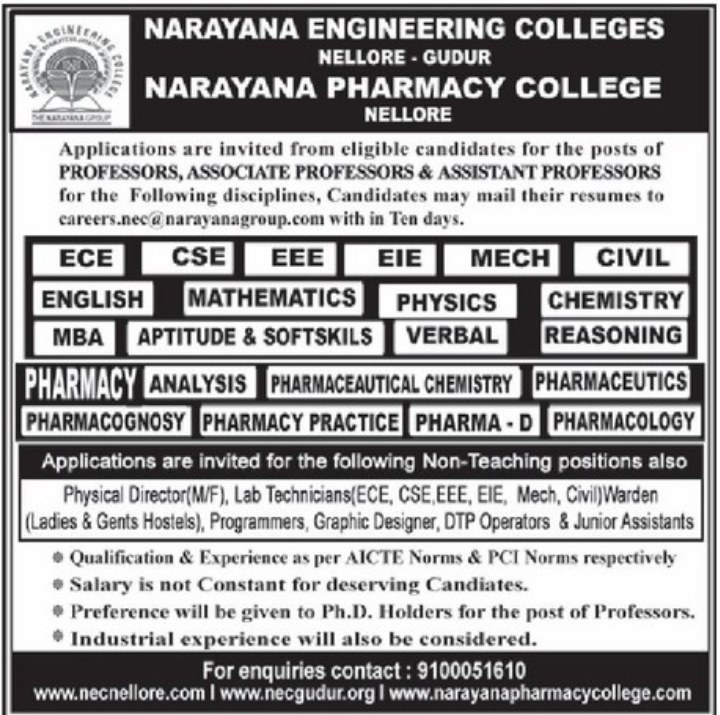 Narayana Pharmacy College, Nellore has advertised in THE EENADU newspaper for recruitment of Professor / Associate Professor / Assistant Professor/Non faculty jobs vacancies. Interested and eligible job aspirants are requested to apply with in 10 days from 13th April 2018. Check out further more details below. 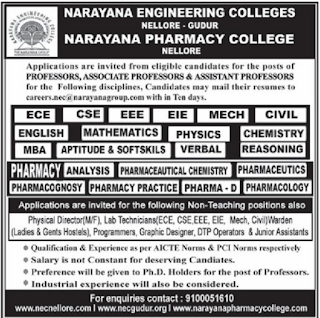 Name of the College : Narayana Pharmacy College, Nellore. About College:The college is situated in the elegant campus of the Narayana Medical College, at Chinthareddipalem in Nellore District, Andhra Pradesh. The Campus enjoys the serenity of pure countryside as well the luxuries and convenience of just 5 kilometers away from Nellore Town. Preference will be given for Ph.D holders for the post of Professors. Industrial Experience will also be considered. Salary is not constant for deserving candidates.